A dark, brooding, well-acted film, which still manages to keep the campy value of early horror films. Made for fans of campy horror movies with a sinister twist. Rated R for bloody horror violence and gore. The new “Wolfman” film, a remake of the 1941 film of the same name, is a movie that hasn’t forgotten its roots, but may have been good to do so just a little bit. It does have a fun, slightly campy feel, but the story is mired in predictability. Bencio Del Toro (“Sin City”) plays stage actor, Lawrence Talbot. He’s come back home to his father’s estate set deep in the English countryside in the 1800s. Lawrence’s brother has died, under mysterious circumstances, and he’s there to investigate. Lawrence’s father, Sir John Talbot (Anthony Hopkins) is a lonely old man still reeling after the death of his wife some 30-odd years ago. The Talbot estate is old and dilapidated. Cobwebs fill the house. You would swear that no one lives there, but Sir John does. What kind of person can live in such a fine house, but exist in such squalor? It’s fairly unsettling, but for good reason. When Lawrence finds out that his brother may have been killed by something that’s not human, something possibly supernatural, he goes to find the local band of gypsies. It doesn’t matter which movie, gypsies are always the be all end all when it comes to knowledge of the supernatural. While Lawrence is interviewing a gypsy woman about what may have happened to his brother, the encampment is attacked by an animal. Well, we all know what it is, it’s a werewolf. It rips people limb from limb. It eviscerates villagers with a single swipe of its claws. It even ends up biting Lawrence who is now doomed to a werewolf’s fate. The film, overall, lacks suspense though. Far too much of the movie is spent on false scares and jumpstarts that have grown so cliché when it comes to horror movies. Something is lurking around the corner, but the character on screen takes forever to walk down the hall, the music is building to a crescendo, and BOOM, something “scary” happens. The reason why we jump is because the soundtrack is pumped up to ultra-max volume and our ears just can’t the sudden jolt of noise. 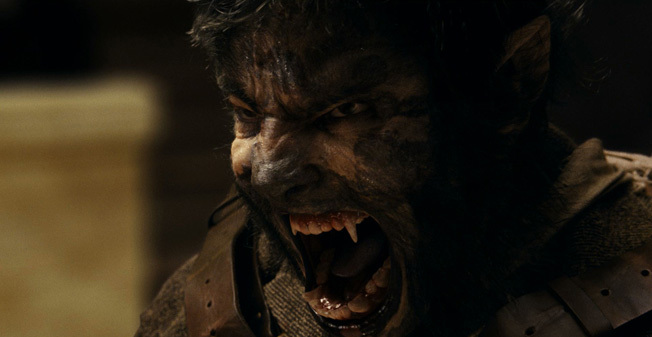 Where “The Wolfman” really shines is in its performances. The story is predictable, and sedentary, but the performances from Del Toro, Hopkins, and even Emily Blunt are the reason for watching the film. Del Toro is at his best when he’s playing a brooding, sullen man and no one is more brooding than Lawrence Talbot. Hopkins gives another fine performance as a conniving scoundrel who you never know if you can trust or not. While there’s nothing new offered during this recent incarnation of a Hollywood horror classic, it does provide a dark, foreboding experience that is actually fun at the same time.